After eagerly waiting for the elder theologian to enter the fray on the topic of Social Gospel, deceitfully renamed Social Justice, Dr. John MacArthur waded into the controversy last week with his first article on the subject. He was quickly maligned as being a white supremacist, as “fighting ghosts,” and was accused of “attacking racial reconciliation.” The aged pastor-warrior has been flogged for defending the Gospel so often and for so many years that he has skin as thick as a dinosaur, and so it’s doubtful he was even aware of the barbs in social media, let alone felt them. He has now launched a second salvo against “Social Justice” on the Grace to You website. Why have so many evangelicals openly embraced such compromises? The answer is very simple. It’s the next logical step for a church that is completely ensnared in efforts to please the culture..The common link in those continual compromises is pragmatism, driven by a desire to reach the world and win its support and admiration by utilitarian means. Evangelicals of our generation seem pathologically addicted to the sin of desiring the praise of men. Indeed, that is precisely the brand of pragmatism that I fear points people down nearly all the paths of departure from the gospel mentioned in Monday’s post. Today it has penetrated deep into the culture of the church, and the end effect is disaster. 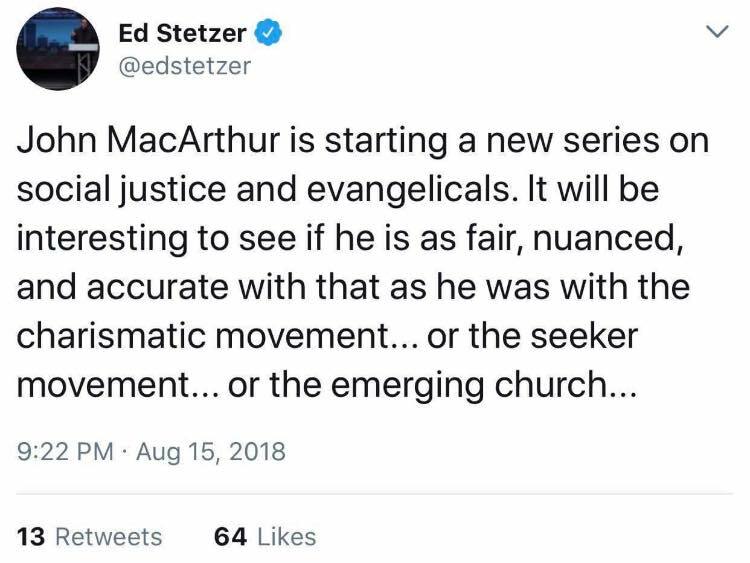 MacArthur then explains that the different forrays into tragic doctrinal compromise we’ve recently seen, using the Seeker Friendly Movement and Charismaticism as two other examples (which I take as a rebuke of Ed Stetzer’s tweet, whether it was intentional or not), are just other kinds of Gospel distraction, similar to the latest fad of Social Justice. These are all distractions designed by principalities and powers to keep us from focusing on the actual, real, Biblical Gospel. These are all a part of the vain philosophies the Scripture warns us not to be taken captive by in Colossians 2:8. I don’t know that there have ever been truer words written that weren’t inspired of the Holy Spirit. The ideas propagated by evangelicals at The Gospel Coalition, certain among those at Together for the Gospel, the ERLC, Southern Seminary and Southeastern Baptist Theological Seminary – chiefly those influenced by New Calvinism – are all ideas that were first created in the secular laboratories of thought and are thoroughly political philosophies. Chasing after the world’s approval, enjoying a momentary popularity among the heathen through worldling pastors like Tim Keller, and with the wheels of these institutions having been thoroughly greased by a proven money trail that leads back to George Soros and James Riady, we now see New Calvinist leaders promoting what amounts to communist ideology in a clerical collar. Even Joe Carter, who serves both The Gospel Coalition and the board of the ERLC, acknowledged in a post just six days ago that a communist Jesuit Priest invented “Social Justice” as we now know the term. The origins of their movement seem not to matter to the Evangelical Intelligentsia, even though they are aware of it. To MacArthur, it matters. You can read MacArthur’s article here. The line to MacArthur a White Supremor angry old bigot forms to the right. I mean…left. It forms to the left.